The Divest Harvard campaign achieved a short-term victory this morning when the University unexpectedly sent a high-level official to accept 1,300 student and alumni signatures in support of fossil fuel divestment in front of over 150 people who had rallied to deliver them. 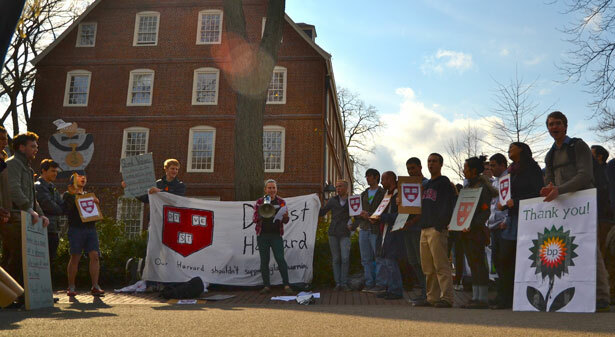 In an open letter published on April 2, students had requested that either a member of the Harvard Corporation or a Vice President attend the rally to publicly accept the petition signatures. President Faust had initially declined the students’ request, offering instead to send her assistant. Less than an hour before the rally, students received word that the Corporation had changed its position and, after the crowd swelled to over 150 students, faculty, staff, and alumni, the University sent a visibly tense Marc Goodheart, Vice President and Secretary of the University, outside to accept the signatures. On April 9, Harvard Corporation member Nannerl Keohane sparked controversy by suggesting that Harvard could “thank BP” for its investments in renewable energy as an example of using shareholder advocacy rather than divestment to help change the fossil fuel industry’s business practices. Students objected to this proposed strategy, citing BP’s numerous oil spills, closed solar plants, and recently sold wind farms as examples of corporate behavior that deserve no gratitude. Tara Raghuveer, the President of the Harvard Undergraduate Council, spoke at the rally along with Harvard alumnus Reverend Fred Small of First Parish Unitarian Universalist Church, Professor David Keith, Harvard College student Hannah Borowsky, PhD student Benjamin Franta, and Harvard Law School alumnus Craig Altemose, Executive Director of Better Future Project. In another divestment victory, a Brown University committee recommended that its institution divest from big coal companies. Alli WeltonAlli Welton is a sophomore studying History of Science at Harvard College and hailing from eastern Washington state. She has been involved since 2011 with Students for a Just and Stable Future, a New England-based network of student groups involved in climate advocacy, and now serves as SJSF's Media and External Communications Coordinator.